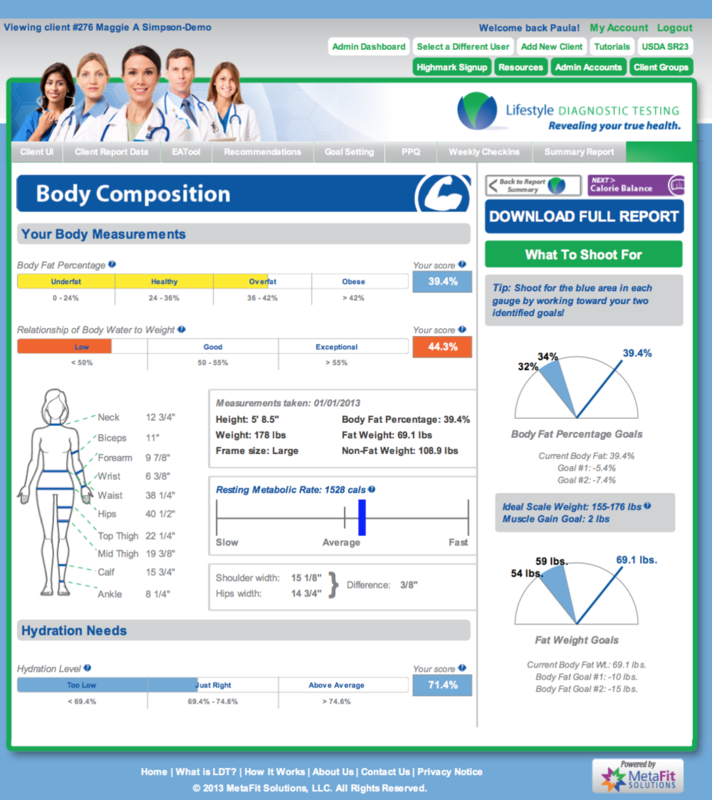 My partner, Min Kim, and I collaborated with MetaFit Solutions, a company that provides Lifestyle Diagnostic Testing (LDT) software to track personal healthiness. For this project, we redefined the user experience with the goal to meaningfully communicate personal health record to the end users and healthcare providers. Taking a holistic approach, we aimed to provide constant, transparent, and personalized care to our users. MetaFit distinguishes itself from other healthcare products by providing constant physical and online engagement between end users and professional healthcare providers over a ten week period. However, both healthcare providers and users expressed that they did not fully benefit from the current system because they experience difficulty in making sense of the complicated health data and utilizing the information to realize their health goals. As a result, MetaFit Solutions is losing a lot of customers. 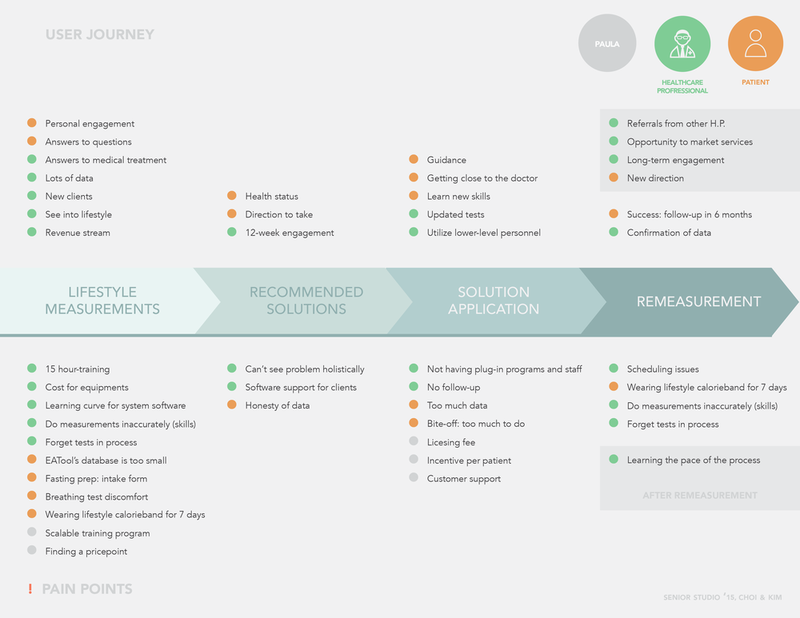 The stakeholder map above shows that satisfaction from healthcare providers and enrolled users are crucial for Metafit Solution to maintain a successful business. However, both healthcare provider and enrolled users are expressing strong dissatisfaction towards the program. Metafit Solution's interface currently displays personal health records in a way that is very complex, visually not appealing, with unclear data visualization. This ultimately inhibits appropriate understanding of the information and motivation to take further action. Metafit Solutions currently repeat the same information in multiple catetories which cause more confusion in understanding the data. 3. Personalize overall experience to meet individual's health needs and living pattern. 1. Reorganizing information presented in MetaFit's current website, so that users can compare and contrast real-time progress data with their ultimate health goal. 2. Finding opportunities where users can integrate other tracking devices they already have (e.g., Fitbit, iHealth, etc. ), so that they can get a more comprehensive overview of their lifestyle progress. 3. Brainstorming ways to encourage healthcare providers to suggest the next step and give positive reinforcement to end users, so that end users are more motivated. 4. Provide ways to schedule in-person meeting online, so that end-users and healthcare provider can discuss weekly life style goals in timely manner. 5. Provide means to customize app behavior and monitoring preferences, so that users can make the most out of the MetaFit experience. 6. Provide online measurement system to expidite onboarding experience. 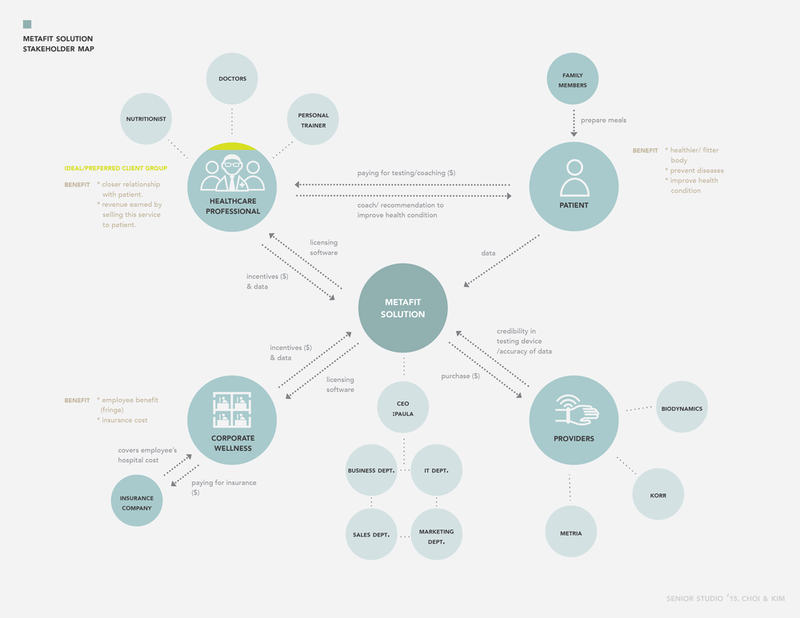 Reorganizing the information architecture and combined related groups, so that users can easily see and make sense of their health outcome causes, daily progress, and suggested next steps. 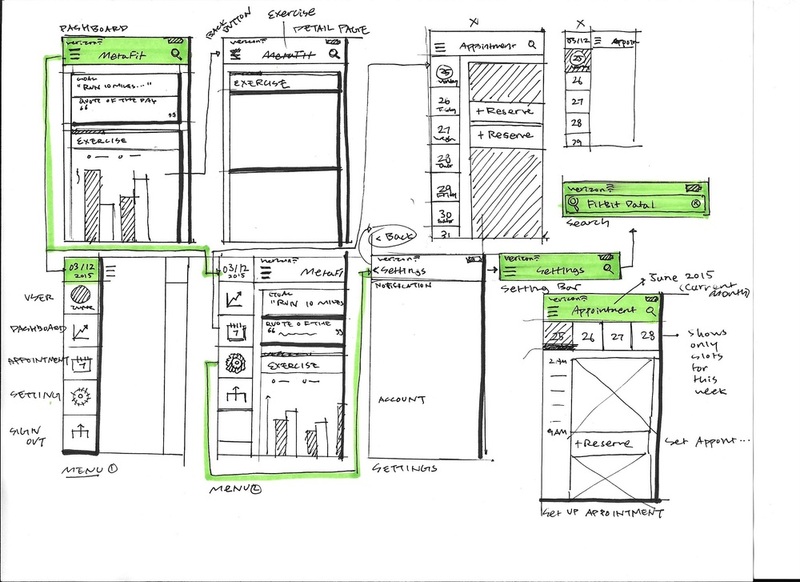 Exploring various ways to visualize data and defining interaction sequence. The revised Metafit Solutions is a multi-device platform where healthcare provider and program enrolled individuals can communicate and share daily progress towards lifestyle goals. With integration with wearable healthcare devices and mobile apps, Metafit dashboard communicates clear summary of the users' performance and suggests where and how they can improve to reach their goals. Personalized notification allows the system to adapt to individual needs and encourage healthcare providers to leave positive feedback to further motivates users. The step-by-step measurement process in the MetaFit mobile app helps healthcare providers easily take and store users' detailed measurements to expedite the onboarding process and start communicating with end users. MetaFit gathers the user's realtime lifestyle data from existing hardware and apps, serving as a central platform and providing a holistic overview of the user’s entire lifestyle. By reviewing daily progress on the main dashboard, users can reflect on their day and see the goals they have achieved, but can still determine areas where they can improve. Users can customize their overall MetaFit experience by setting up notifications and monitoring preferences. Users can set the tone of software, select activities they want to monitor, and choose whether they want to receive location based notification or not. MetaFit adapts to individual health needs and living patterns to help each user achieve his or her goals most effectively. MetaFit also sends out healthy reminders and goal reinforcements to provide constant care. The healthcare provider has access to real time progress data anywhere at anytime through the MetaFit mobile app, and can leave direct feedback or words of encouragement based on the user's progress. 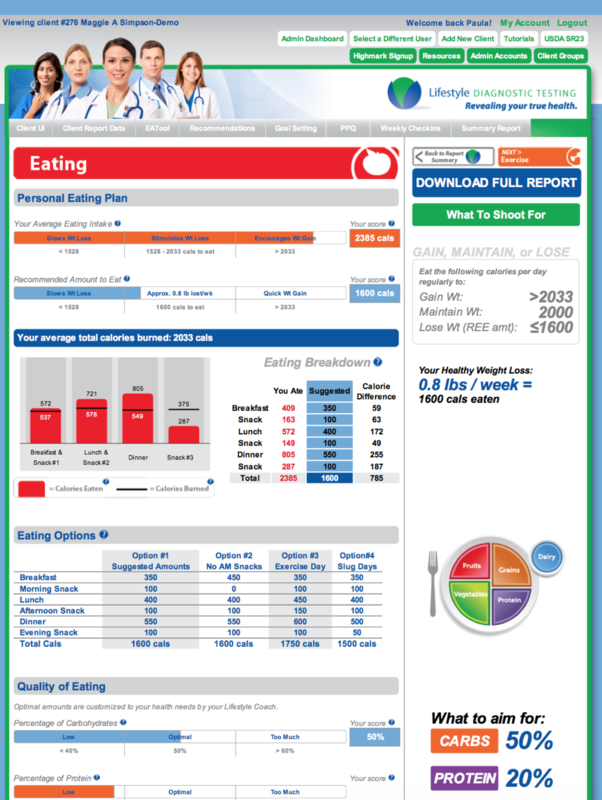 Both healthcare provider and end-user can set up achievable daily goals on the user’s calendar. Both healthcare provider and end-user can set up physical and online appointments as needed during the 10 weeks of engagement through the calendar section in the MetaFit application. The calendar also displays daily goals and achievements, keeping them on the same page.